One of the first detailed map of the Taiwan / Formosa interior. Formosa Island and the Pescadores China. An extremely interesting, important, and uncommon map of Taiwan or Formosa issued in 1870 by the American Consul at Amoy, Charles W. Le Gendre. 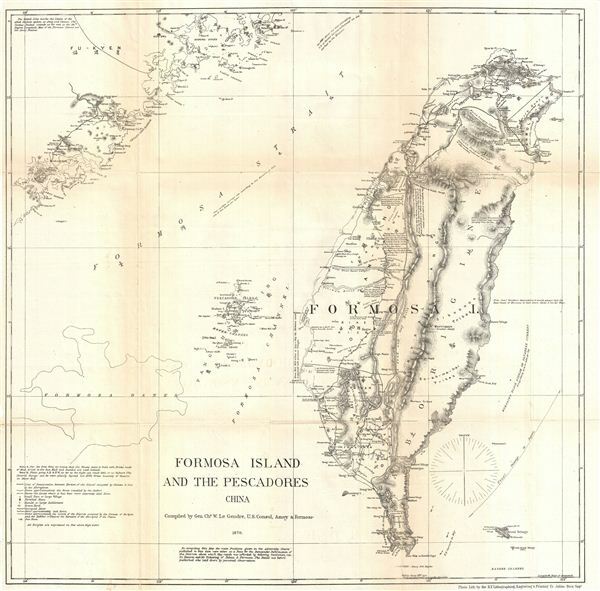 Focusing on the island of Formosa, this map covers from Fu-Kyen (Fukien), China to the Botel Tobago. Includes the Pang-Hoo-Ting Island, undersea features such as the Formosa Bank, and more inland detail than any map of Formosa previously published. This map originated with the unfortunate Rover Incident. The Rover was an American fishing vessel that shipwrecked in southern Formosa. Though the crew of the Rover was killed by the Taiwanese aboriginal population, it was widely assumed that they were alive and being held for ransom in the southern part of the Island. Le Gendre petitioned for and was granted the right to take an armed expedition into the region in the hopes of recovering the Americans. Though none of the Rover's crew remained alive, Le Gendre did succeed to producing the most sophisticated western map of the interior of Taiwan or Formosa to date. Though ostensibly a rescue mission, his study of Formosa is clearly laid out with commerce in mind, for his notes sugar growing regions, mineral (particularly coal) supplies, camphor districts, and woodlands are profuse. In the age of great steamships, coal was of particular interest as the U.S. need coal supply station in the China Sea region. It was known that the mountainous interior of Taiwan held considerable supplies of the precious commodity and part of Le Gendre's expedition involved finding ways to exploit it. Le Gendre, C. W., Notes of Travel in Formosa, vol 4, plate 1, 1874. Very good condition. Minor toning, wear, and verso reinforcement on original fold lines. Else very clean. Library of Congress, G7910 1870 .L3 Vault (Le Gendres original manuscript).